A Vietnamese frigate participates in an international parade at sea Thursday with warships from 12 other countries. The 015 Tran Hung Dao, a Russian built Gepard-class frigate with advanced military equipment, arrived in South Korea Wednesday along with a Vietnamese delegation for the International Fleet Review, Bao Hai Quan (Vietnamese Navy) newspaper reported. It is captained by Colonel Le Hong Chien, Deputy Commander of the Naval Region 4 Command, which manages waters along Vietnam's south central coast. Vice Admiral Pham Hoai Nam of the Vietnam People’s Navy will also be present at the event. 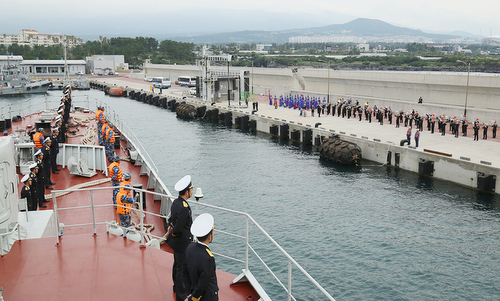 The fleet review is taking place off Jeju Island between Wednesday and Monday. 13 countries including the U.S., Russia and India are set to show off 41 warships, including the USS Ronald Reagan aircraft carrier, and more than 20 military planes at this year’s event, with the main display on Thursday, media reports said. Russia and the U.S. have sent the largest contingents, with three warships each. China has sent delegates but no vessel, said a South China Morning Post report. Vietnam's Tran Hung Dao is on its 9,300-kilometer long journey to Japan, South Korea and China, beginning last month. The voyage, the longest that any Vietnamese naval vessel has undertaken, aims to strengthen friendly relations, cooperation and development among naval forces in the visited countries and affirm the capability and position of the Vietnam People's Navy in the nation’s international integration. The warship had paid a three-day visit to Japan last month, in which its crew participated in a series of friendly games with the Japan Maritime Self-Defense Force in Yokosuka. After the fleet review in South Korea ends, it will travel to Zhanjiang, China for a joint ASEAN-China maritime field training exercise. Several foreign naval ships have visited Vietnam in recent months, reflecting the country's growing willingness to boost security ties and intensify defense diplomacy efforts with major powers, experts have noted.